A very large and (newly) framed Glasgow School polychromed silkwork oval panel designed by “Glasgow Girl” Ann Macbeth (1875-1948) and almost certainly worked by her as well, depicting a bride/queen and her attendants; c1910. Very scarce. Ann Macbeth, a leading member of the Glasgow School Movement, was born in Bolton in Lancashire and was both an embroideress and author. She studied at the Glasgow School of Art from 1897 and indeed won a prize for her needlework two years later. She eventually succeeded Jessie Newberry in about 1911 (she had been her assistant since 1901) as head of its embroidery department, having taken charge of the embroidery classes there in 1908. Her work was always, and still is, very highly regarded. In fact Francis Newberry wrote an appreciation of her in The Studio in 1902. She also taught metalwork, bookbinding and ceramics and, as a freelance artist, produced designs for jewellery, carpets and textiles. Examples of her work were exhibited at Miss Cranstons Tea rooms in Glasgow and, amongst numerous other commissions, she also designed for Libertys in London. She also published five books on embroidery, including Educational Needlework (published in 1911, with Margaret Swanson), Needleweaving (1922), Embroidered Lace and Leatherwork (1924), and Countrywomans Rug Book (1926). Examples of her fine work are held at the Victoria & Albert Museum in London. 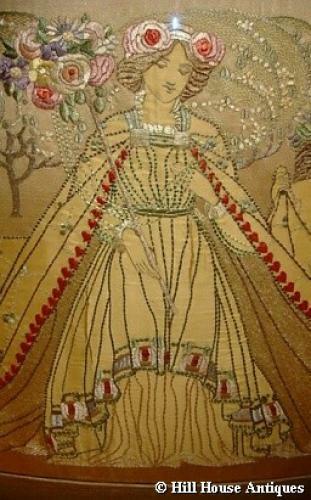 A similar unfinished design is illustrated in Glasgow School of Art Embroidery 1894-1920, p 25 exh 50, which was both designed and worked by Ann Macbeth. Further ref: The Studio Yearbook of Decorative Art 1914, p67 showing the same design, by Ann Macbeth and worked by Mary Woodhead. h: 28” w: 51” inc frame.